Cottonmouths (Agkistrodon piscivorus), also called water moccasins, are venomous water snakes of the pit viper family. These snakes are native to the rivers, lakes and swamps of the southeastern United States, where their range and habitat often overlap with other, harmless water snakes. Many of these nonvenomous water snakes are mistaken for cottonmouths due in part to similar coloration or patterns and are often needlessly killed. Several species of the genus Nerodia, or water snakes, are mistaken for cottonmouths regularly throughout their range. These snakes, like the northern water snake, broad-banded water snake, yellow-bellied water snake and the Mississippi green water snake can superficially resemble a cottonmouth due to their dark, dull coloration, rough scales and the uniform bands around their bodies. Because they also spend much of their time in the water, these snakes may be difficult to identify at first glance. Graham's crayfish snake has a range that overlaps much of the cottonmouth's and, like the cottonmouth, this species spends a great deal of its time in and near the water. They can also resemble cottonmouths in appearance, with their dull brownish scales. Unlike cottonmouths, however, Graham's crayfish snakes have a light yellow or tan stripe along their sides, which is not always obvious to observers, especially when seen from above. These snakes are nonvenomous and hesitate to bite even when handled, and tend to be secretive. Much like the other species mentioned, the western mud snake is often mistaken for a cottonmouth because of its preferred habitat and its range. From the top this snake may resemble a cottonmouth because of its dark coloration. This snake's underbelly, however, gives its true identity away. Western mud snakes have bright red ventral scales -- something that a cottonmouth definitely lacks. Eastern hognose snakes, despite preferring a drier habitat than cottonmouths, are sometimes mistaken for the venomous species. Some of these harmless snakes may have faint bands or be completely dark colored, making them appear similar to cottonmouths. In addition, this species' distinctive defense display, which involves theatrically flattening their heads, hissing and striking closed-mouthed, can be mistaken for the cottonmouth's more aggressive defensive stance. 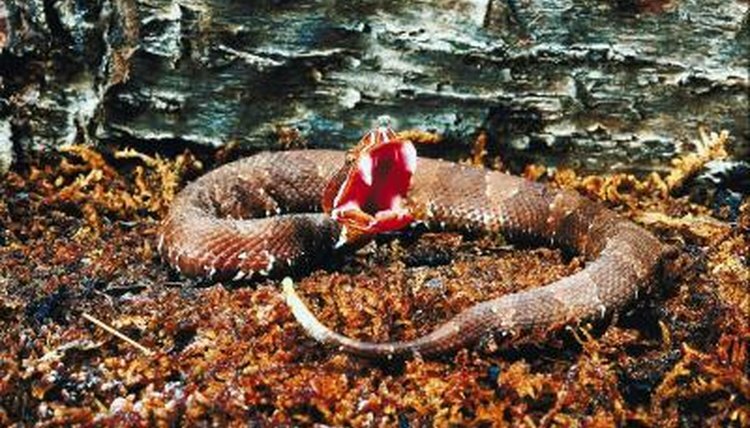 Though some species may resemble cottonmouths, these venomous snakes are still identifiable if you know what to look for. Adult cottonmouths are heavy-bodied snakes with noticeably thicker heads than bodies (something that distinguishes them from many of the water snakes they are mistaken for). Their coloration is dark olive to brown, with blotchy dark markings on their backs. These markings may sometimes be similar in color to the rest of their scales, giving the impression of a uniform coloration. Their bellies are cream colored in contrast to their backs. When threatened, cottonmouths will curl into a loose coil and gape their mouths, displaying the white lining that gives them their name. When cottonmouths swim, they will normally hold much of their bodies above the water, something that sets them apart from water snakes that swim with their bodies mostly submerged. Tennessee Herpetological Society: Is It a Cottonmouth? University of Florida: Harmless Watersnake or Venomous Water Moccasin?